Literally one of the dumbest servers I have ever played since I started in 2001. The power level gap from each 100 levels is like going from Krillin to Goku.Even then the potions you get at lvl 200 mean a lvl 400 cant usually kill a lvl 200. Death and evo tokens are useless because 99% of the players are bots. This whole server is here to make pvp nerds dicks hard for two seconds because they botted and got 550 in a few days. Has a couple good ideas, but not enough.
" After level 600 the exp rate from monsters gets reduced by some different factors but you still gain 1x experience from mechanics like orbs and skulled creatures. " Please, explain exactly what these factors are. sooo beta was now online for over 2 months,, there is still lots of players and im very happy with how it everything has went so far. i have clear idea what needs to be fixed/changed and added for future updates. Vocations are balanced. RP is fuking great vocation - hard to kill if u know how to use mana shield and so op damage. Would be nice if u added more quests and reset when u are more active and when u have more time. Make harder to exp + more task npcs and random bosses should be hit more than they do now. + would be nice if they drop some more rare items. Also would be nice if whole team gets exp for killing player not only 1 player Would be alot harder to bot and ppl would more pvp than just bot. hello, now beta has been online for over 3 months,, its still quite popular even though i have been quite inactive :& just thought i would write some small update about what plans there are for the server currently i'm not at home, and will be returning home the 5th january, and then there will be more frequent updates like there was in the start since then i have much more time for the server! last few days i have also been in contact with a scripter, and a mapper to try and have some more people working on the server. the scripter has done some small simpler systems that are already done and will be used in future areas added, he has also done a quest. the mapper is currently working on making 3 new spawns, and he has created 1 quest already. add another npc, where you could choose to join dwarf/elf/cult faction. upon completing the mission you for example become a "dwarven master sorcerer", each faction would have some passive ability, unique spells to their faction and some other things. complete quests & monsters in 750 area. -Some small map bugs were corrected. -Monster boxes now gets removed after 1 hour of not being used. -Fixed an issue that caused monster boxes to spawn on places that weren't intended. -Discoverer outfit now has the correct name. -Thunder hammer now has -2% damage taken instead of -4%. 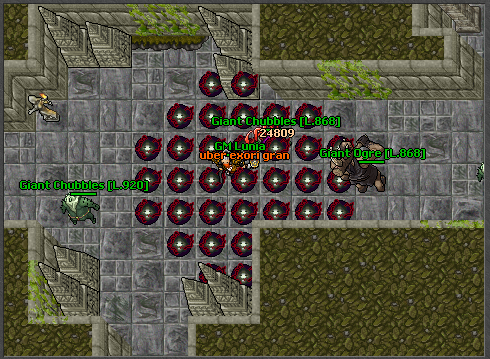 -Added a new spell for knights above level 700+. "Uber exori gran" it's a stronger version of their previous aoe spell. 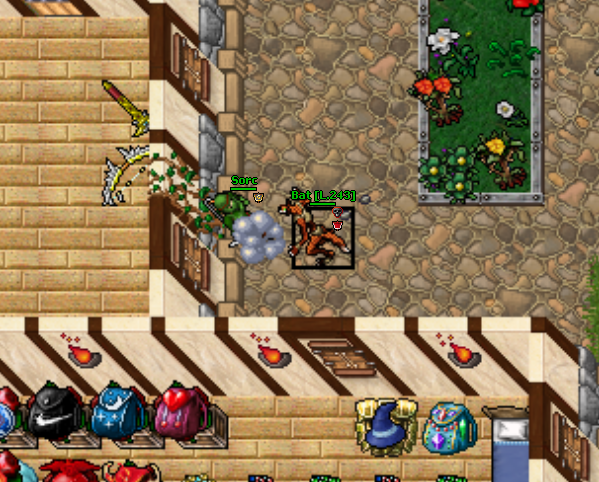 -Monster boxes can no longer spawn monsters behind a wall/in unreachable locations. -Haste & strong haste no longer stacks with eachother. -The ingame autohealing will now properly heal mages health, before in some cases it wouldn't cast healing spells even if you were low on HP, that was fixed now. They're located inside the 750+ area. -Added four new quests inside the 750+ area. Most of the quests also contains some new systems, so please send feedback if you would like to see more of such things in the future. -NPC Daily now has another keyword, if you ask him about "points" he will now tell you how many of his random points that you have unlocked. 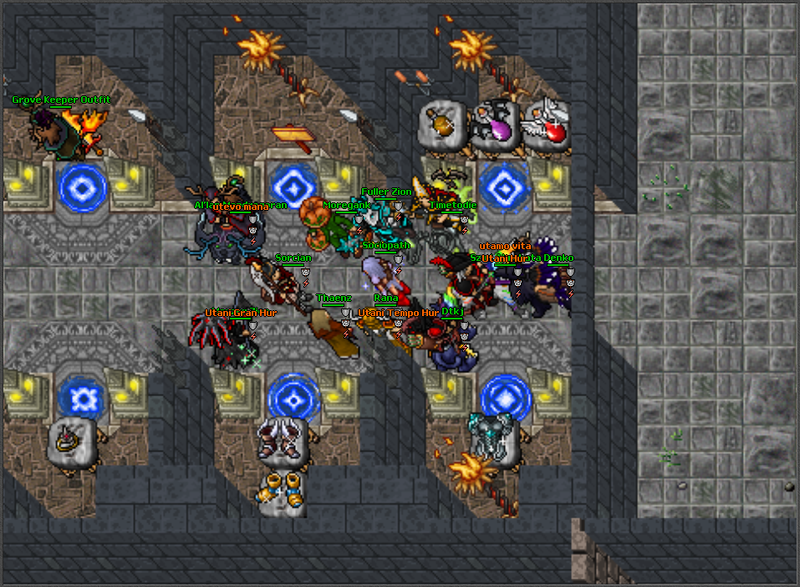 -Decreased the power of most quest monsters inside the 500+ and 650+ quests. 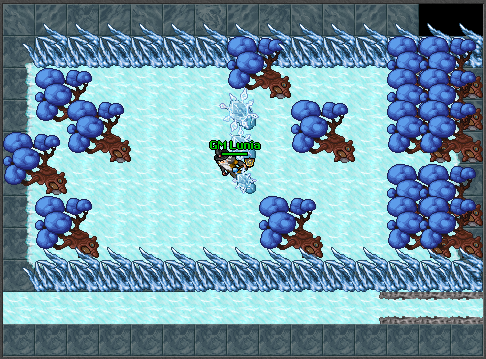 -Added a new quest inside the 350+ zone. -Added two new normal Bosses (the ones you can see with the command), they're located insided the Death Dragon spawn and the Cavedweller spawn. That should be everything, maybe I missed adding something to the list, and I will try my best to make some weekly patches.